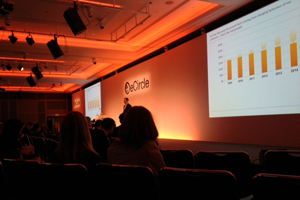 Ecircle held its annual Connect Europe conference yesterday at London's Grange Tower Bridge Hotel, an event that saw 600 delegates inspired by presentations from Innocent founder Richard Reed and adventurer Sir Ranulph Fiennes. Connect Europe 2012 was attended by delegates from corporates and agencies and representatives from across Ecircle’s business. Breakout sessions were led by speakers including Football Association community manager Andy Smith and Dunelm Mill head of multichannel Saj Bhojani. The day, which was organised by Ecircle head of marketing Lucy Hudson, her team and agency Worldspan, opened with an introduction by Ecircle chief executive Volker Wiewer. Reed followed shortly afterwards and spoke candidly about Innocent, sharing the business’s successes and failures and discussing at length the smoothie brand’s use of technology and social media.